Do Insect Wings Have Bones? When you accidentally stepped on that grasshopper outside, you may have heard a "crunch" and cringed, thinking about broken bones. The bad news is the bug probably didn't survive your foot, but it wasn't because his bones were broken. Insects don't have bones; instead, their limbs and wings are made of cuticle. Wings, legs, joints -- all these parts of an insect are made of insect cuticle, a substance that's actually much tougher than bone. It's not made of cells, like your skin is, but instead is more like your fingernail, made mostly of proteins secreted by underlying cells. The secreted proteins are supported by chitin, a natural polymer that provides the cuticle's strength and prevents tearing. Different parts of the insect have different proteins, so the cuticle's strength changes according to body part. Though it's tempting to imagine an insect's life as an easy one, all insects put their bodies through a great deal of stress. They don't just hang out on foliage all day. Insects jump, take off and land, and flutter their wings throughout the day as they look for food and evade potential predators. Their cuticle composition gives them durability and flexibility, allowing them to do these movements repeatedly and effortlessly throughout their lives. A moth's wing looks as if it would tear as easy as tissue paper, but cuticle helps the wing maintain its integrity. However, a wing's membrane isn't as tough as cuticle elsewhere in an insect's body. A 2012 study in the scientific journal PLoS ONE noted the cuticle in grasshopper legs is one of the most durable natural materials in the world. However the cuticle in insect wings is different, and not as strong as in other body parts. But that's OK because a network of veins in insect wings work as reinforcement to help keep wings from cracking. A network of veins and the cuticle work together to give insect wings ultimate protection. If a wing experiences a crack, the crack stops when it encounters a cross vein, which acts as a barrier for further cracking. According to the study, these barriers increase insect wing toughness by 50 percent. In theory, it would make sense for the wing to be filled with veins and made of more durable cuticle to make those wings impenetrable. However, wings need to be light. 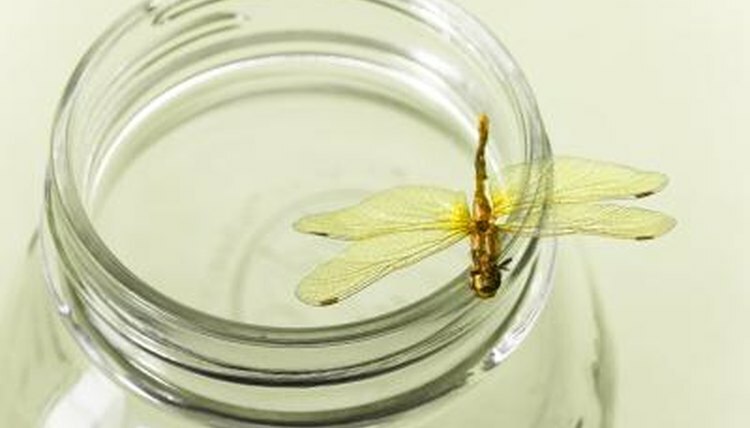 Nature found the correct balance for insect wings; they're light enough for flying, but strong enough to last a lifetime. Science Daily: Transparent, Thin and Tough: Why Don't Insect Wings Break? Why Do Termites Follow an Ink Line? Why Do Insects Have the Skeleton on the Outside of the Body? How Do Honey Bees Smell, Feel and Taste? What Are Ants' Body Parts? Do Arachnids Have Compound Eyes Like Insects? What Are Three Traits of an Ant? Why Are Bugs Attracted to Light at Night?